Now made with real shepherds! Ahem…back to this amazing recipe. 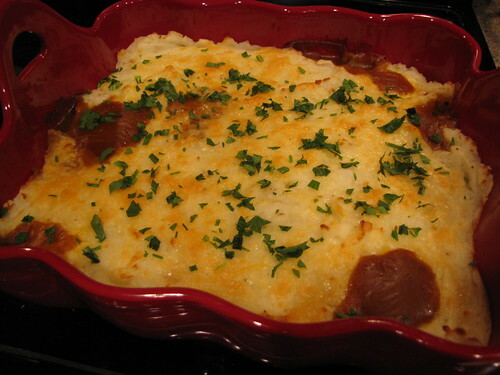 Shepherd’s Pie is comfort food through and through…beef stew meets mashed potatoes topped with cheese. 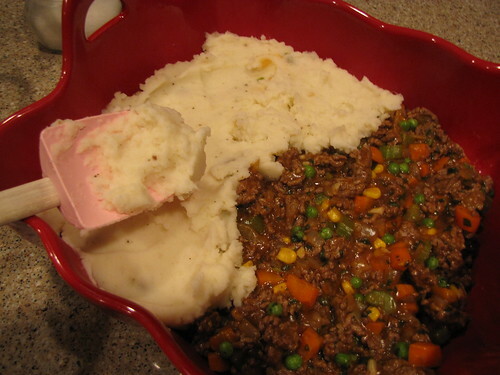 Traditional Shepherd’s Pie was originally made with lamb or whatever stew meat was available. 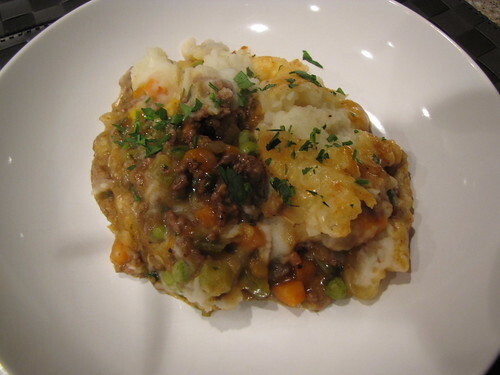 A quick visit to The Wiki reveals at least a dozen countries or cultures that have some version of this dish whether it be cottage pie, potato pie, or even a vegan version called Shepherdless Pie made with lentils and/or tofu. Ha! Guess I wasn’t so far off about the shepherds after all. 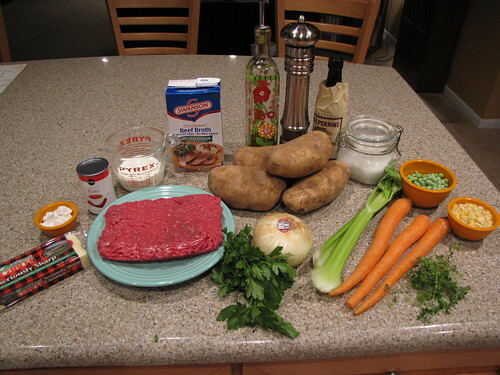 For our pie, we’re going with ground beef and lots of veggies under that potato crust. Ground Beef, Russet Potatoes, Onion, Celery, Carrots, Garlic (not pictured), Peas, Corn, Beef Broth, Tomato Paste, Flour (GF is fine), Olive Oil, Worcestershire Sauce, Fresh Parsley, Fresh Thyme, Cheddar Cheese, Milk, Butter (optional, not pictured), Salt & Pepper. 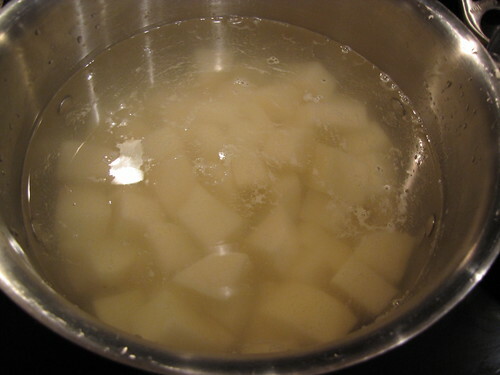 Peel 4 russet potatoes, cut them into big cubes, and place them in a large pot. Fill the pot with cool water to cover the potatoes by at least an inch, bring to a boil, and cook until the potatoes are fork tender, about 15 minutes. Once the potatoes have cooked, drain them thoroughly in a colander and return them to the pot. Cover to keep warm. 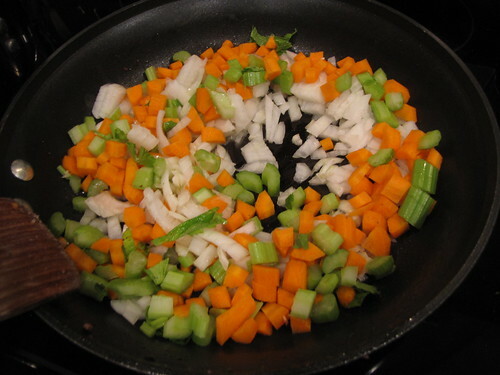 While the potatoes are cooking, finely chop 1 large onion, 3 carrots, 2 ribs of celery, and 3-4 cloves of garlic. Finely chop 1/4 cup of fresh parsley and 1 Tablespoon of fresh thyme leaves. 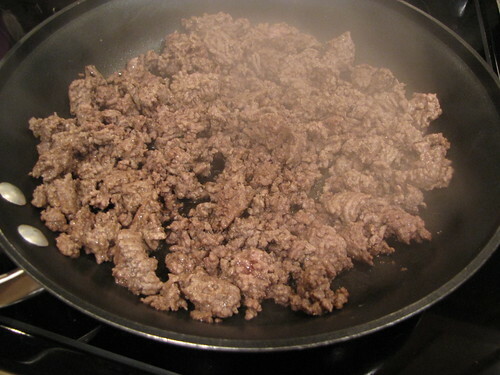 Heat a large skillet over medium high heat and brown 1½ pounds of lean ground beef. Cook the beef until no pink remains and it has nicely browned bits on the edges. 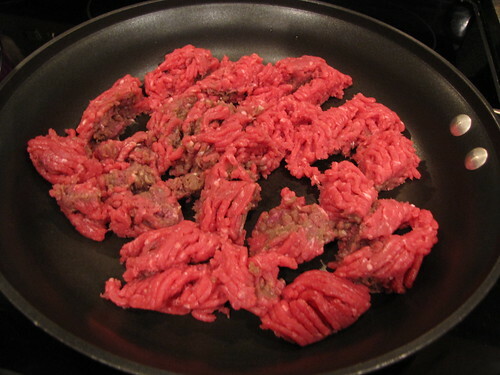 Remove the beef from the pan and set aside OR use another big pan and cook the veggies at the same time. Heat 1-2 Tablespoons of olive oil in a large pan over medium high heat. 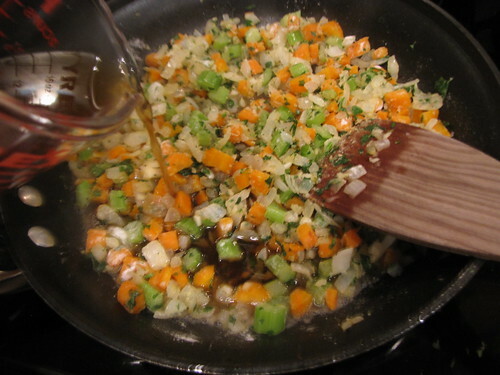 Add the chopped onion, carrots, and celery and sauté until tender but not browned, about 5-7 minutes. 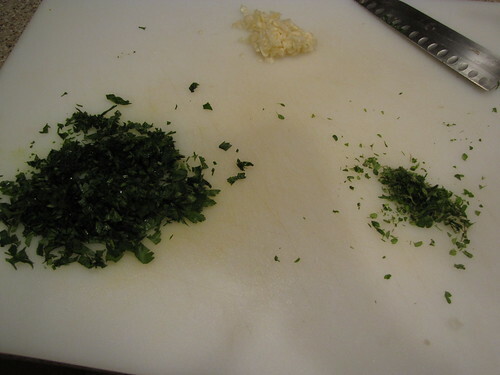 Add the chopped garlic, thyme, and HALF of the chopped parsley. Reserve the rest of the parsley for garnish. 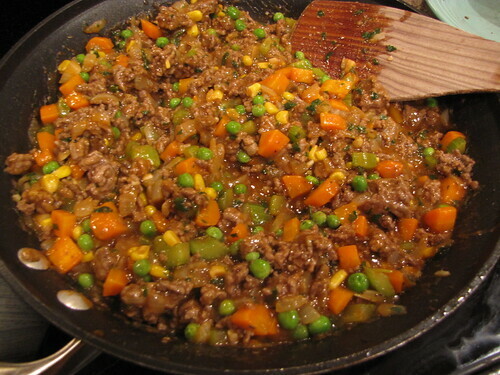 Stir the flour into the vegetables until thick and slightly pasty then slowly add 2 cups of beef broth. 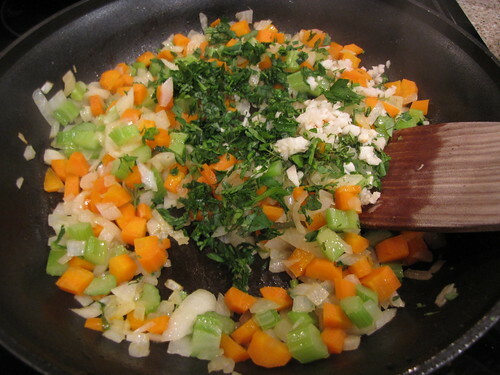 Stir the broth into the vegetables until it makes a nicely thickened sauce. 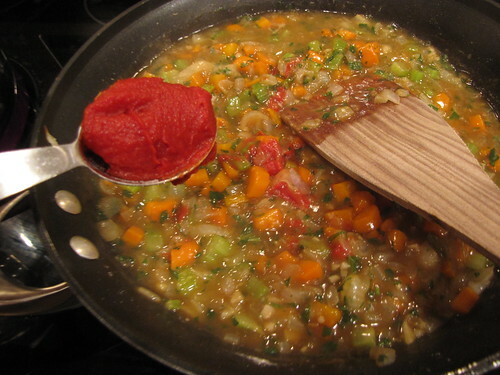 Stir in 2 Tablespoons of tomato paste, 1 Tablespoon of Worcestershire Sauce, and season with salt & pepper. 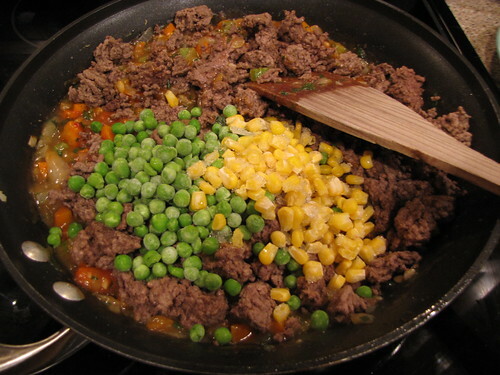 Return the cooked ground beef to the pan and add ¾ cup frozen peas and ½ cup frozen corn kernels. Stir to combine all of the ingredients. Taste and adjust the seasoning with salt & pepper. The filling should be brothy but somewhat thick. Feel free to add a bit more beef broth (or water, or beer, or wine) if you need more juice. By now your potatoes should be cooked and drained. Add ½ cup whole milk, a pat or two of butter, and salt & pepper to taste. Mash with a hand masher or whip with a hand mixer. I actually like a few lumps in my potatoes so the hand masher works for me. You might need to add a bit more milk (or heavy cream if you’re feeling naughty) to get a nice mashed potato consistency. 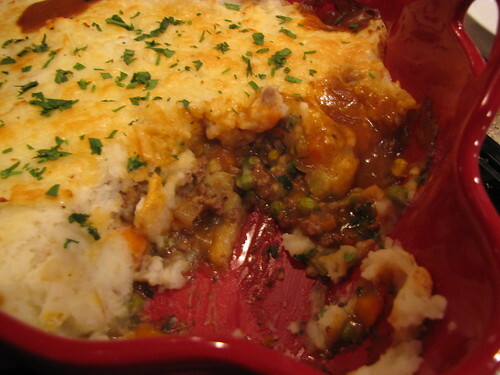 Grab a big baking dish (9×13) with high sides and pour the meat filling into the bottom. 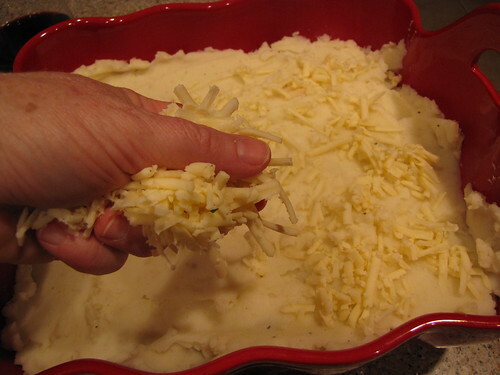 Spoon the mashed potatoes on top of the filling and smooth them out over the top. 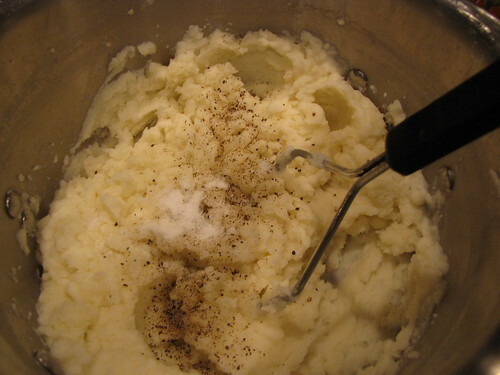 Work your spoon or spatula all the way to the edges to get a good seal of mashed potatoes all around the edge. This is important so that the filling doesn’t bubble up (as you’ll see in my photos later). 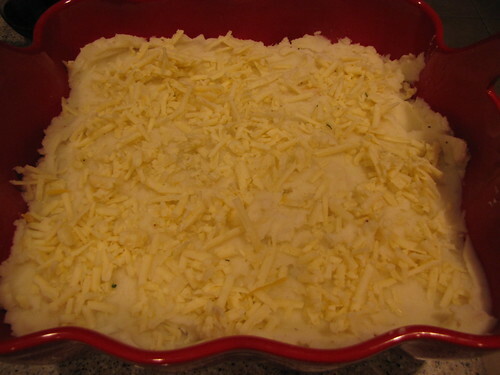 Sprinkle ½ cup of grated white cheddar cheese over the top of the potatoes. If you are using a shallow baking dish like a pyrex, place the dish on a baking tray or cookie sheet just to be sure it doesn’t bubble over in your oven. Bake at 400 degrees for 25-30 minutes until the top of the potatoes turns golden brown. You can see that the scalloped edge of my dish, while pretty, made it hard to get a good seal of potatoes around the edge. Oh well, still tastes great! Sprinkle with the remaining parsley on top to garnish. 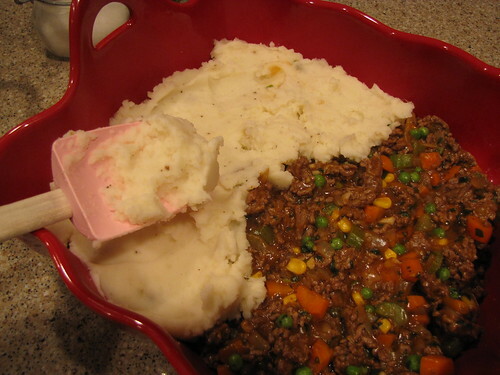 Let the Shepherd’s Pie rest for 10 minutes to set up before serving then spoon it into bowls. I’m not sure why it took me so long, or what inspired it now, but this was my first Shepherd’s Pie. Believe me, it won’t be the last. No shepherds were harmed in the making of this dinner. I make shepherd’s pie often, with leftover lamb, but why have I never thought to sprinkle cheese on the top? That just kicks up the yum factor to 11! This looks amazing! 😀 I’m printing the recipe now. Maybe be next weekend? I’m so glad you don’t use real shepherds. anymore. This is coach’s favorite meal. 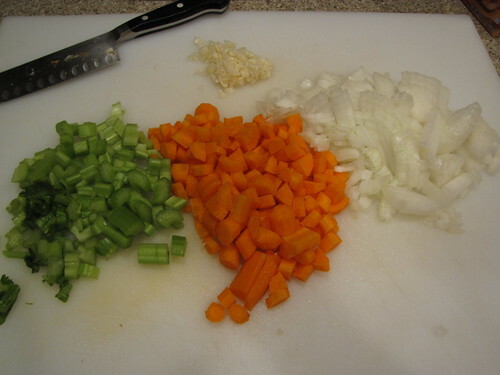 I really load up the veggies to offset his carnivorous taste buds….I’ll try your version next time. LOOKS amazing!